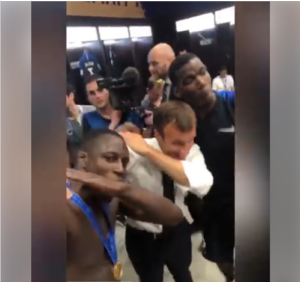 French President Emmanuel Macron made an exception of his corporate mood on Sunday night as he dabbed with Paul Pogba and Benjamin Mendy in the dressing room following Les Blues’ 2018 FIFA World Cup final triumph. Pogba was on target as Didier Deschamps’ men beat Croatia 4-2 in a memorable final, ending the country’s two-decade wait for a second World Cup in style. And the 40-year-old French Premier was invited to the dressing room, where he partook in the celebrations with the rest of the players. 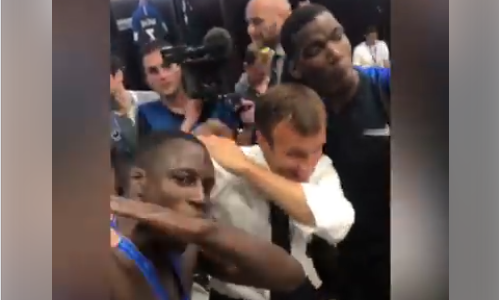 And Mendy’s post on Instagram has gone viral, for it’s not every day you see the head of the government dabbing. Macron was in attendance, along with Russian President Vladimir Putin and Croatian Premier Kolinda Grabar-Kitarovic as Les Blues and the Vatreni treated footballing fans to a memorable summit clash.